New Delhi: Trek Bicycle, one of the world’s leading bicycle manufacturers, today announced its foray into the Indian market. 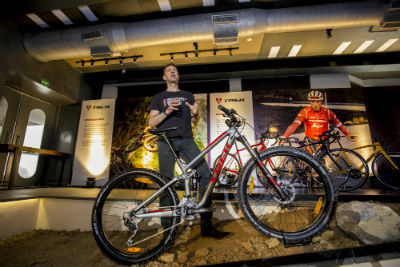 Trek unveiled a collection of road, mountain, and hybrid bicycles at the Qla, Mehrauli. Present at the launch were Trek India’s Country Manager, Navneet Banka and former German professional road bicycle racer Jens Voigt. Trek Bicycle was founded in 1976, in Waterloo, Wisconsin, USA, by Richard Burke and Bevil Hogg, who set out to create the best bikes in the world. They fostered a culture of craftsmanship, where every bicycle built was a point of pride. Trek has grown far beyond its modest roots, but to this day every bike made is a testament to the company’s founding principles. Today, Trek bicycles are available at retail locations in 100 countries worldwide. The brand also offers a dynamic range of cycling parts, accessories, merchandise, and riding gear under the brand name Bontrager. With over four decades’ legacy of driving innovation, Trek is known for building the most technologically advanced bicycles available. Trek pioneered the manufacturing of carbon bicycles in the 1990s, and today continues to build on its tradition of leadership in the industry, applying the same technology used in aerospace and Formula One racing to create the finest bikes for every kind of rider. Trek bikes are built to last, and everyone is backed by a simple promise from the company: we’ll take care of you and do what’s right. Each model is subjected to extensive testing in the world’s toughest test labs and supported by the best lifetime warranty in the business, all the way back to the very first frames built in 1976.